The toaster is a small appliance designed to toast multiple types of bread products. Pop-up toasters make toast from bread in 1 to 3 minutes by using heat elements. 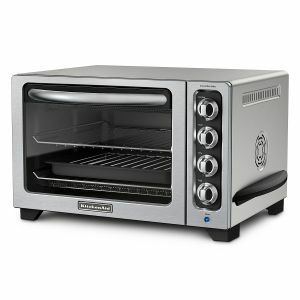 Toaster ovens have heat elements above and below a grilling area that is large enough for reheating a slice of pizza. The ideal toaster can provide even toasting over the area of the bread. The user should be able to chose the darkness of the toasting. Various toasters can process bread into toast at different capacities. The toaster's controls should be labeled to permit easy use and predictable results. Toasters with a permanently attached crumb tray will be more difficult to clean than those with a removable tray. There can be variation on the placement of a cord as well as retraction functionality.